No real point in listing all the various LDO and PK marks as these are widely available from numerous sources. There does still seem to be considerable misconception about the exact purpose of these markings however. The LDO mark ( with L/ prefix), more properly known as the Herstellerzeichen, was introduced on 1 March 1941. The origins of the LDO lay in a meeting held at the Pr?sidialkanzlei where it was decreed that in order to maintain the quality and thus the prestige of military awards and decorations, their manufacture was to be controlled and licensed. A further notice on 1 November 1940 from the Pr?sidialkanzlei publicised the fact that the manufacture of orders and decorations for the private retail market was permitted only by Licensed firms. Firms who failed to follow regulations could be and indeed on occasion did have their manufacturing licenses withdrawn (Petz and Lorenz and Otto Schickle of Pforzheim being two examples). The actual LDO numbering was introduced on 1 March 1941 (ref. Uniformen Markt, 1.3.41) and required all awards from that date to be marked with the manufacturers LDO code. The original proclamation reads ""Jeder konzessionierte Hersteller erheilt soeben ein Kennzeichen (Herstellungsnummer) das von 1.3.41 ab auf den einzelnen Orden und Ehrenzeichen anzubringen ist, bei einseitigen Originalen und 16mm Verkleinerungen auf der R?ckseite, unten in der Mitte, bei doppelseitigen Originalorden und 16mm Verkleinerungen in Kreuzform (EK2, Ritterkreuz, Grosskreuz) wird die Zahl in den eingeh?ngten Ring eingeschlagen". The regulations also covered the packaging in which the awards were supplied. These were to be clearly marked with the LDO logo and the underside of the case/carton was to have the manufacturers LDO number ink-stamped. As far as Iron Crosses, for example, were concerned the following were specified. ?Full Case? (i.e. the good quality case with hinge, press stud etc). Grand Cross, Knights Cross, Oakleaves, EK1, EK1 Spange. Note that the regulations specify a case with LDO logo for the Grand Cross, RK and Oakleaves. It is well known that many wartime orders were not fully complied with, but, despite the fact that many have doubted the originality of RK or Oaks cases with the LDO monogram, original orders specified that these MUST be used for not only the RK and Oaks but the Grand Cross, confirming not only that these did exist but that the Grand Cross was available for commercial retail sales ! One thing which is perfectly clear from original wartime proclamations is that the LDO was NOT responsible for awards supplied to the military EVER, only for private retail pieces. This is important. Comments are often made on the quality of awards such as ?the LDO would never have allowed something like this to go out?. Frankly, if the manufacturer supplied a poor quality award to the Pr?sidialkanzlei, the LDO couldn?t do a thing about it. Only the Pr?sidialkanzlei was responsible for official award pieces, the LDO only for restrikes/copies. 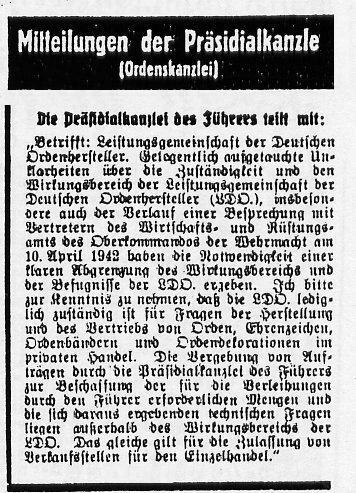 Even at the time (Uniformen Markt Issue 9, 1 May 1942) Dr. Dohle felt it necessary to publish an announcement making it clear the restrictions on the LDOs authority. ??? ?..the LDO is ONLY responsible for the manufacture and quality of orders etc FOR PRIVATE RETAIL BUSINESS. Orders made through the Pr?sidialkanzlei for awards, and all associated technical matters are NOT to be dealt with by the LDO????.? Attached is a copy of the proclamation relating to this. 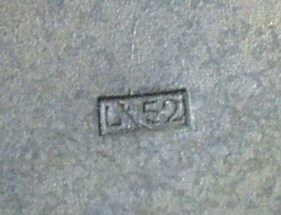 On the subject of the actual markings themselves, during the Third Reich period anyone who had lost their award could obtain a free "official" replacement through the Pr?sidialkanzlei, purchase an additional piece "officially" or buy one at their own expense via the LDO retail outlets, ( these LDO marked pieces were in the terminology of the time referred to as Copies , Replicas or Restrikes). Note that this facility to obtain official replacements does not just relate to awards instituted during the Third Reich. A soldier for example, who possessed the 1914 Iron Cross First Class and lost or had his award damaged, could obtain an official replacement, and this would be appropriately marked with a Pr?sidialkanzlei Lieferant number, such as "4" for Steinhauer. If he elected to purchase his own privately just because he wanted an extra example, it would be marked with the LDO number. As far as dual marked crosses are concerned, as the LDO marks predate the Pr?sidialkanzlei marks, it is likely that these were initially LDO marked then had the PK number added when they were used to complete an order from the Pr?sidialkanzlei. In 1941 the retail sale of high grade decorations such as the Knights Cross and above was forbidden. Retailers were allowed to retain only display samples and all others had to be handed in to the Ordenskanzlei, the manufacturers being compensated appropriately. These LDO marked pieces ( like Juncker L/12 Knight's Crosses, L/50 marked Godet Oakleaves etc) were subsequently used as official award pieces. There is no evidence that any lower grade LDO marked pieces such as War Badges, EK1s, KVKs etc were ever used as formal award pieces. Could it be possible to find LDO mark with the "/" in the other way such "" ? Interesting. I don't know whether the slash can go the other way, but on the two L/52 boxed stamped markings I have, the slash is a typical "/". Both stamped markings are slightly different though, one on a screwback EK1 and the other on a Silver Wound Badge, so two separate punches were used imo. Thanks for a very informative thread. However there are still a couple of things that are not clear to me and perhaps you can help me out. ".... the by-law of 1st July 1937 designated Hitler as the sole authority in bestowing official decorations and awards. From here on, the Präsidentialkanzlei des Führers, and it's subsidiary branch, the Ordenskanzlei, exercised strict control over the creation and production of decorations, and selected the various companies that would be awarded goverment contracts. Located in Berlin, this institution was led by Ministerialdirektor Dr. Heinrich Doehle. Manufacturers, after being chosen for the production of actual award pieces, were assigned a Lieferanten-Nummer." "In Juli 1940, the Leistungsgemeinschaft Deutscher Ordenhersteller more commonly known as "LDO", was founded and put under the direction of its general manager and NSDAP member, Schürmann." Is it fair to assume that 1937 was the actual date for the introduction of the PK numbers? Also, the control of official awards was conducted by the Ordenskanzlei, led by Doehle, but was the LDO a sub-branch to the Ordenskanzlei, thus giving him superiority over Sch?rmann? Is it known what date Otto Schickle's license was revoked? In St.&L. 's add from 1941, the articles Dienstauszeichnungen der NSDAP, verkleinerungen, anstecksnadeln, decorationen etc are mentioned. 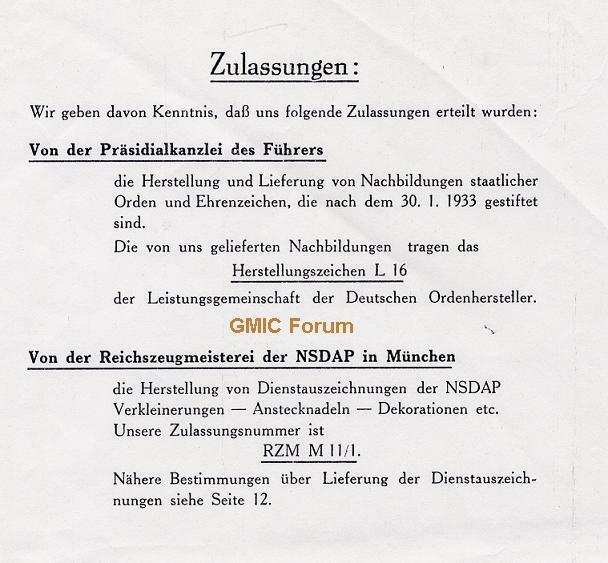 A recent thread on this forum featured a NSDAP LS miniature with the RZM number M11/1, which should be correct for NSDAP LS decorations. When was the sub-group M12/... founded (NSDAP LS miniatures). I know that RZM numbers are a totally different ballgame, but it would be interesting to know, especially since I can't find St.&L. amongst the M12 firms in any reference book. Bringing this one back to the top. I haven't seen any original source documents which refer to the date of the introduction of the Lieferant number for the PK. It would make sense that whenever official government contracts began to be issued for awards, that a numbering system would have begun around the same time. Of course the military awards only began to appear after the outbreak of war so if the numbers were introduced in 1937 there wouldn't have been much use for them other than on Political awards. I think the real question is not so much a case of when the numbering system was introduced but one of when the use of these numbers to mark the manufacturers products was mandated. Generally speaking these numbers tend to appear on late war pieces however there are a number of exceptions - for instance Steinhauer & Lück's KVK1 are often found in early quality silver plated tombak, but with the PK number "4". So, I think the numbers may have been around for quite some time,possibly even before the LDO and certainly some early pieces may be found with PK numbers, but that these numbers were only widely used (in the sense of being stamped onto the awards) in the second half of the war. As an organisation, the Ordenskanzlei was certainly superior to the LDO which was only concerned with regulating the quality of copies of awards made for the commercial market, and had nothing to do with the official awards. Otto Schickle gained their licence in March 1941 and lost it soon afterwards. There is an entry in the July 1941 Schwert und Spaten indicating that Schickle had been given permission to sell off existing stock. Perhaps it may have just been a temporary revocation of their licence though for some misdemeanour ?. Afraid I can't help on the RZM numbers. I have no interest in Political awards and so have never made any attempt to study these numbers. I'm sure there will be some evidence or other in the pages of Schwert & Spaten/DUZ. The abovementioned type of KVK was actually on of the reasons for my inquiry. I'm still not clear about some aspects, but I'll stand down for the time being and see if I can figure out a way to put words to these complex questions. Just for the sake of it a basic list which might save doing some looking up. LDO Leistungs Gemeinschaft der Deutscher Ordenshersteller Numbers. L/51 E. Ferdinand Wiedmann, Frankfurt a. M.
I have an incuse PA makers mark on the back of a Blockade Runners' award. Any ideas ? What is the reference for this list? Is there any proof for the above assignments? This would be an important question to clear up. Hello! I just wanted to know, it's not exactly makers marking, but I want to ask about Hindenburg Cross I've collecting. In the front of the medal, there's years marked. And according to maker, the number/numeral comes with different FONT sizes. My question is, like Mayer&Wilhelm comes with 11pt? sizes. Twer&Turck comes with 8pt sizes. Are the FONT sizes set for each makers? Pls excuse me, I have another question regarding Hindenburg maker marks. I sincerely hope? that I will be.... Anyway, I have a Hindenburg Cross, combatant, and it is without maker mark behind. Is it considered fake? Also I suspect there are over hundred different maker markings. May I suspect that this is due to the fact that there was 121 battles during WW1? I really imagining, is it? Looking forward for your.....answer.